Depending on how actively you’re following the goings on with WordPress, you might have heard the words Gutenberg and WordPress block editor coming up lately. Or maybe this is the first time you hear it in relation with WordPress. Whether the case, WordPress block editor (a.k.a Gutenberg) is the future of WordPress and in this post, I want to talk a bit about the changes coming to WordPress 5.0, what it means, and what to expect. Even though the new WordPress block editor is not officially released as of yet, it’s already available for download here. I’m using it to write up this post and I absolutely love it! What is this new WordPress block editor? 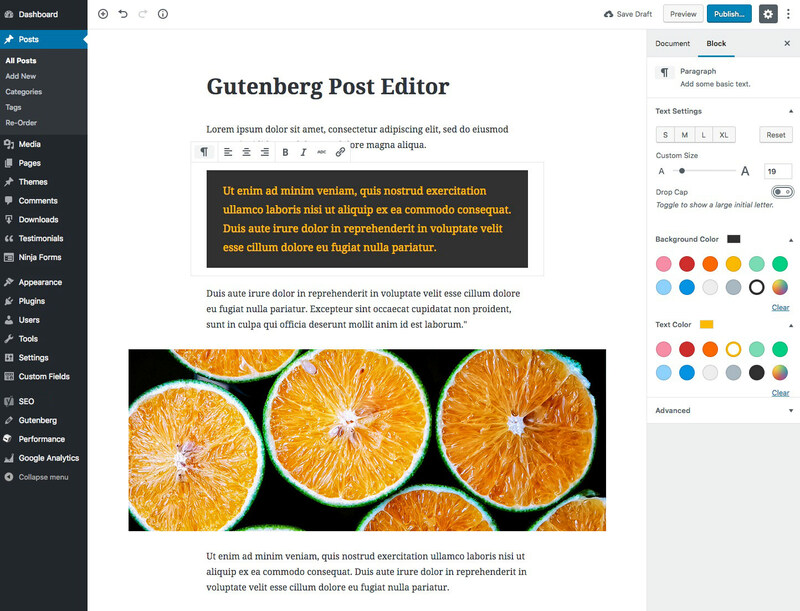 Currently known under a codename Gutenberg, it’s a completely new post and page editor. 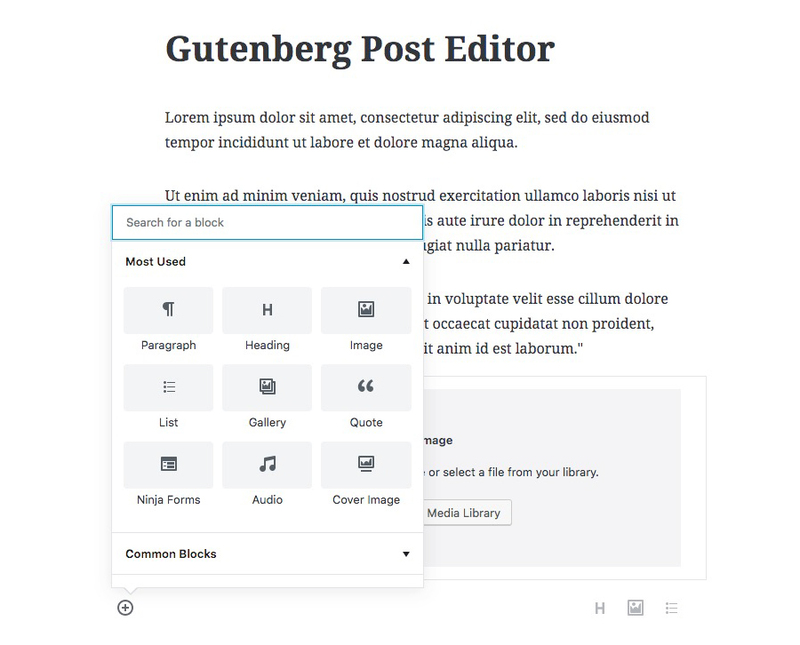 By the time Gutenberg is merged in WordPress core, the editor will be called “WordPress editor” or “WordPress block editor”. The goal of this new WordPress block editor is to create a more intuitive, easy-to-use, modern, and flexible way for building content in WordPress. WordPress has been around for 15 years already and about 31% of websites on the internet are made with WordPress. This new WordPress block editor will mark the first step for the next 15 years for WordPress. Since there is a lot to consider when making such big changes, the whole transition process will be split into multiple phases that will probably take a couple of years to complete. So don’t worry, the world of WordPress will not change in a day, this is just the beginning of a long and exciting journey. The first phase for Gutenberg will be introduced in WordPress 5.0, this year (2018), at the end of November. WordPress 5.0 will replace the old post and page editing screen with a new, block-based editor. All your old posts and pages will still work but now you will be able to write your latest content using a brand new block editor. WordPress Classic Editor will be included in the WordPress 5.0 update as well, so if you’re not quite ready for the new WordPress block editor just yet, you will be able to use the Classic Editor as a plugin. Classic Editor plugin will be supported for two more years, so you will have plenty of time to transition to the “new WordPress”. Blocks are the main feature of the new editor, that’s why it will be called WordPress block editor. When creating content, you will use a new tool called blocks. Each piece of content (heading, paragraph, image, quote, etc.) is going to be a separate block element that can be manipulated individually. While all these elements (headings, images, lists etc.) were already available in the old editor, sometimes making everything work together nicely was as a bit of a hustle. Often you needed to make use of things like widgets, embeds, shortcodes and theme options to make something look a certain way. Thanks to the new post editor, working with content will be much easier and more visual. Each block will have its own specific settings right there in the post editor. You will be able to use these settings to create unique, rich layouts that you just couldn’t create before without writing custom code. Each piece of content will be automatically separated in blocks, so you will be able to build, rearrange and style your content with very little technical knowledge. Plus the whole interface will be much cleaner and easier on the eyes. Just look at this beautiful example post created with blocks. As I mentioned before, the new interface will look much cleaner but that’s not all! The new WordPress block editor will try and make your content look as similar on the back end as it is on the front end. If you place a gallery in your blog post, you will actually see a gallery show up in your post editor while you’re still writing your piece. You will be able control and instantly see how things look without the need to go into preview more each time you make a change. Another great features I’m really excited about is the ability to easily make some of your content wider than the content area. Gutenberg will let you take elements such as images, galleries, embeds and more and make them wider or even span to the edge of the screen while your headings and paragraphs will remain inside the content area. Up until recently, you could get such layouts only if you’re using a fancy designer theme and know what shortcodes and “hacks” to use. Now you’ll be able to do that in almost any theme by clicking on a button! If you feel especially artsy you will be able to change the text size of certain paragraphs, set a background color for emphasis, change text color. I hope you are starting to realize just how much freedom of expression you’re going to have with the new WordPress editor! As I mentioned before, Gutenberg is set to be released November 27, 2018, when it will be bundled with WordPress 5.0 update. I’m using it already and you can too – download the Gutenberg plugin and start exploring the possibilities today. If you’re a developer, make sure you check out the official Gutenberg handbook to familiarize yourself with the new codebase. As for those who are not as tech-savvy, Gutenberg is not yet “mainstream” so there isn’t a lot of beginner-friendly resources out there, but I do intend to change that. I’m planning to write up a couple of tutorials that will help beginners get comfortable with the new WordPress editor. So if you have any questions about Gutenberg or ideas for articles that might help you, feel free to leave a comment and I will do my best to make your Gutenberg experience as awesome as it can be!